my goodness. thank you voters and commenters and Melethia. the importance of hair (style), reverberations of Sophia. Picture of the artist as a young man ? Dorian Gray or Phil Lynott. Much the same, it's all swept under the rug. Best in show. My first look at the FS. Glad I didn't miss this well shot portrait. Love it. Message edited by author 2012-12-09 13:56:02. I enjoyed yours very much, as it is such a fun image. Message edited by author 2012-12-09 13:56:18.
wowza. perfect and perfectly presented. a new classic. Ha! Oh... I LOVE THIS! Great finish, glad to see this do so well! Beautiful closeup. Love those curls. This made me giggle. Well shot! gotta love it... the curls are awesome but the pink nose and big ears... oh my. Is time of year for Grog to get haircut. time to see the hairdresser. What a great hairdo!! This is adorable. Lovely light, for one thing, but the slight smile, the hidden eyes, the wonderful curls... just an adorable shot of your model! This is such an interesting image! 'Moi' really needs a haircut. Nice image with lots of details in it. 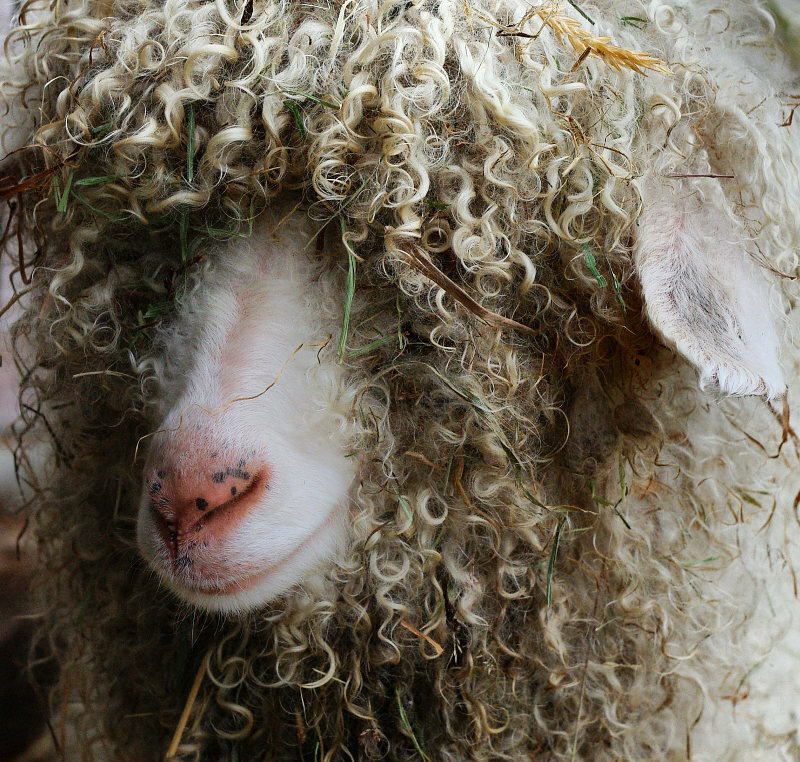 This is a fabulous close-up of this wooly sheep. Love that I can see all the details from the fine hair on it's mouth area to the whorls and curls of the hair complete with bits of hay & grass. The only thing that would be an extra bonus is if the eye was seen peeking out from behind all the hair. After a day at the spaaaa? LOL! Great! That is some fine detail work! With freckles on your nose and grass in your hair. Cute! Nice use of filling the frame. Good soft, diffuse light. One of my faves in this challenge and a perfect 10! Proudly hosted by Sargasso Networks. Current Server Time: 04/18/2019 11:18:35 PM EDT.